If you have a skill, you should probably use it. Better yet — flaunt it. With so many talent shows out there nowadays, the internet is filled with amazing performance after amazing performance. Like this one you’re about to see — a daughter sings a tribute to her mom, and it’s glorious. Laura Kamhuber decided to audition for The Voice Kids Germany, but it wasn’t just a last minute decision. Apparently, Laura has been singing for as long as her parents can remember. Laura’s parents say that she was always meant to sing — she always has a song in her heart. When she was just 3-years-old she was performing in retirement homes for senior citizens. She loved spreading joy to others. Ever since then, she knew she loved being on stage and performing for people. She has spent hours practicing and honing in on her skills. Laura has made it a life goal to become successful in the music industry. 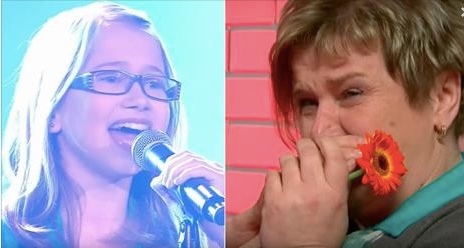 Of course, auditioning for The Voice Kids Germany was the perfect platform for her. Laura’s mom has always encouraged her daughter to follow her dreams of becoming a successful singer. That’s what makes the performance you’re about to see so special. It’s a dedication to her supportive mother. Continue to the next page. Everyone was in tears! OMG, what a beautiful voice. Belle chanson belle voix. Mais la maman pleure comme si elle venait de prendre connaissance de la chanson!!! Amazing and at such a young age. Beautiful just beautiful. Dolly Parton (The original) would love it as well. Hope she would be able to hear it.. I had to go back and watch it again. She is Amazing and hits the high note. Now there’s a star for sure.